This recipe was requested by many Bartholomews. 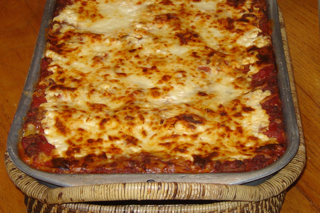 It is remembered as THE lasagna recipe, and has been enjoyed at many family meals. Mix “V-8″ juice, tomato paste, tomatoes, spaghetti sauce mix and mix with brown hamburger; bring to boil. Spray a 10×14” pan. Put dry noodles in pan, top with 1/2 cooked sauce. Add 1/2 cottage cheese, 1/2 mozzarella cheese, then make another layer of noodles, sauce, cottage cheese, mozzarella cheese, and sprinkle top with Parmesan cheese. Cover with foil and refrigerate overnight. Bake, covered, 1 hour at 375°. Remove the cover for last 15 minutes of baking time to let it brown.